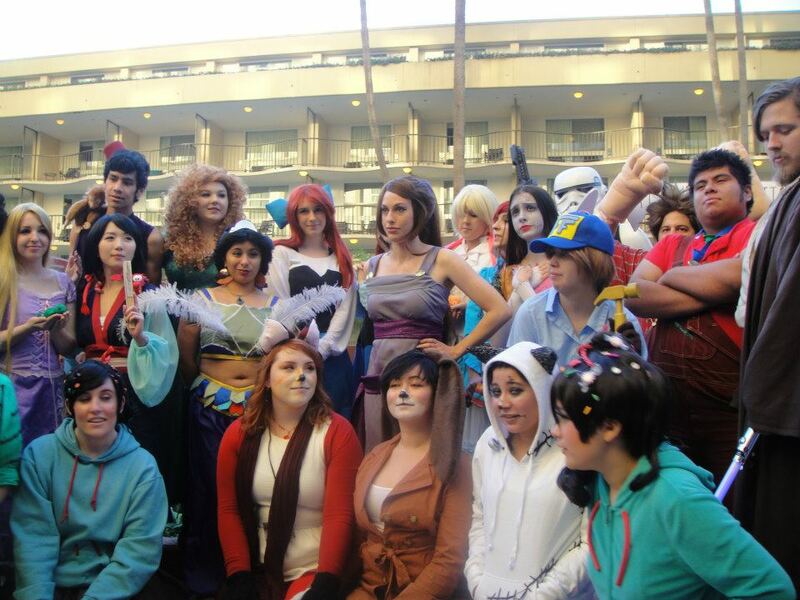 My Anime Los Angeles 2013 experience was fantastic! There’s a reason that it’s my favorite convention. I guess I'll start at Day Zero. Despite what a lot of people thought, I was pretty satisfied with Day Zero. I arrived at the hotel about 5:30pm as my friend was working that night. We checked in without much hassle, but despite asking for a balcony room we were given one on the first floor. It wasn't a huge deal and I'm pretty sure they gave it to us because our friend Andrea was in the prop wheelchair; rather funny when you think of it that way. Two of my friends had to leave for work so my friend Sarah and I stayed in the room, settled in, and waited for the last of our room-mates to arrive. One brought a microwave which was a glorious thing. I suggest this to you all. Around seven we all headed down for badges and ice cream. The badge line for pre-registration was really short and I got my badge in a matter of five minutes. The only thing the convention didn't have ready was the bags but that was really no problem as we got ours the next morning. The ice cream was good, they didn't run out very fast, and there weren't tons of people so it was a rather satisfying evening. I spent most of it talking to people and being an anti-social socialite. Unfortunately, I did get sick so the rave wasn't in the cards for me. That made me a little sad, but not to a point that I was upset. My friends all had fun so I'd say it was a pretty successful party. After that I headed up and tucked in around one in the morning. Day one was BRILLIANT! I was in my favorite cosplay, Ariel, and I had a Disney Princess group which was lot of fun. The irony of the situation though was that while dressed as Ariel, I lost my voice. No one really let me forget it until a week after the convention when I finally found it again. Anyway, I'm a huge Jenn and Kelly fan and as such I made it my personal mission to go to every one of their panels. The first was a personal Q&A that I got a front seat for because my amazing friend saved me a spot in line. The panel was entertaining and light spirited, keeping everyone entertained throughout the hour. Most were upset that we had to leave. 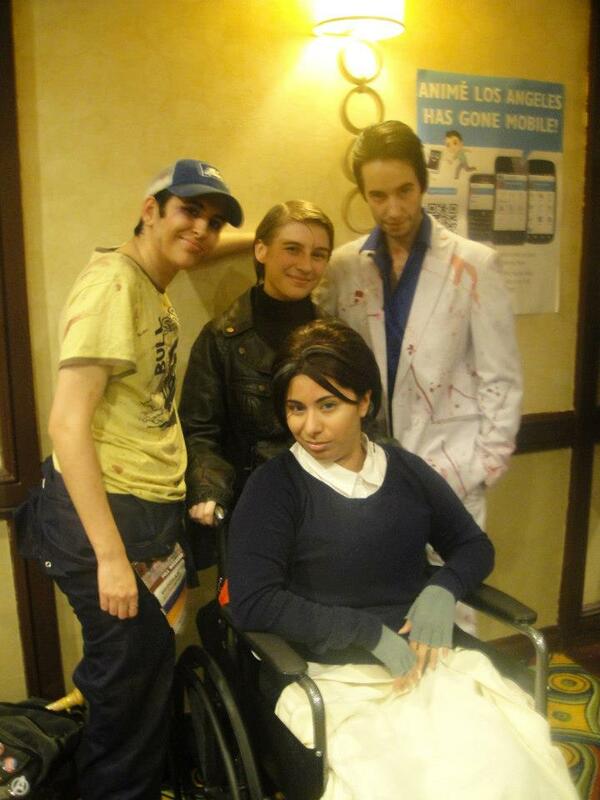 After the panel, my friends and I headed to the Dealer's Hall. I was rather happy with the placement. They didn't have some of the booths they usually do which was interesting to say the least but the new ones made up for it in the end. I bought a few things then headed up to the Artist’s Alley. Sadly, the bottom of my heel didn't make the trek with me as it got EATEN by the escalator. One short funeral later, I was perusing the artists. The Skullgirls artist was there and I'm terribly certain I made a fool of myself. I hope I didn't but I'm sure I did. Calling someone your god tends to do that. A short round trip and one commission later had me looking at an empty wallet for the rest of the con. I have a bad habit of letting Day One at any con get my money. 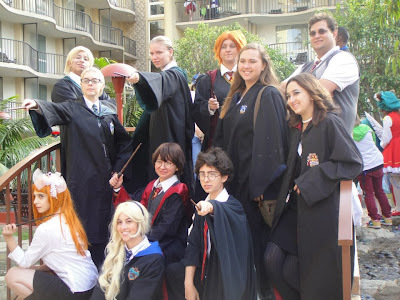 I put everything away then headed down to the Pool Deck to go to the Avengers Gathering to take pictures of my friends. It was fun and never boring. As soon as that ended, I went to the Disney Gathering about five feet away from the last one. It was a tad unorganized since I'm pretty sure the person running it didn't actually show up but fun nonetheless. 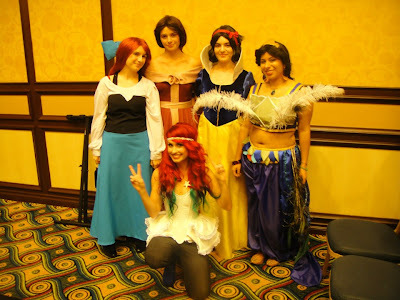 I made some Ariel friends and met the rest of my group. The rest of the day was spent hanging around. I went to the Traci Hines concert as I love her and wouldn't forgive myself for missing it. She was wonderful and I'm sad more people didn't show up but that just means more bubbles for the rest of us! Her pianist, Adam, played beautifully and her friends from Bad Wolf sang with her. All in all it was a great hour. Afterwards, we got pictures and so forth. She complimented my Ariel which I just about died for. Anyone complimenting my cosplay gets me all flustered. Beyond that, I had a relaxing night…until the Rum Party that is! Due to my sickness, I wasn't feeling very lucky but I did hang on my friends for a bit. I chatted with people I hadn't seen in years and watched the pirates dance. I'm sad to hear it could be the last one but I'm happy for the Captain and his family. The Rum Party was a good time even without the gambling, although my friends pooled in and bought six people which was pretty great. Day Two was a glorious adventure of wonder and majesty! It didn't start that way though as my friend didn't wake me up for Jenn and Kelly's morning panel. I was quite upset. I wanted to go. After a bit of pouting I got dressed as Yin from Darker than Black and headed downstairs. Most of the last day had me walking around and talking to people. I went to Jenn and Kelly's Avengers panel, which was amazing, and watched Jenn as Loki try to pick up Mjölnir. I just about died of laughter. Afterwards they both signed my drawing. That was glorious. The only other thing I really remember was the Masquerade. Dear god I really hated that. I can't have too much of an opinion on it compared to others since it was the first one I'd ever been to. In the three years I've been going to conventions, I've never felt like the Masquerade was worth my time. I'm sure they are usually but this one was not. As a first experience, it made me never want to go to one again! There were only three or four skits, each ranging about a minute or so, and the rest were people showing off their cosplays. 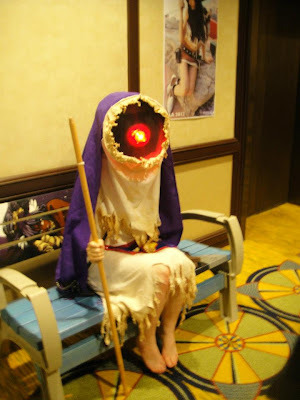 I'm not saying I didn't appreciate people's cosplays, but there were so many that I just got tired of it. When it finally got to intermission, I was excited because I wanted something where it wasn't just people walking around. However, the dancing was rather subpar and it lasted about ten minutes too long. After that I was begging for people to just come on stage and present themselves. That, however, did not happen. Instead, “Who's Line Is It Anime?” got on stage and did their bit. I've been to their shows before but this was just terrible. I made it about two minutes into that half of the show before I stormed out in annoyance and boredom. Overall, after I left “early” I really felt that I never wanted to go to a Masquerade ever again. I probably will but I'll have so much skepticism that I may not enjoy it. The rest of the night was just relaxing in the Jacuzzi and watching Sherlock. Day Three was checkout day and it was probably the least stressful last day of a convention I've ever had. I woke up rather early, went down to Jenn and Kelly's Makeup tutorial panel, got my commission, and then back to the room to pack and checkout. My friend let me stash my luggage in her car so that we could go around the last day as Charles Xavier and Erik Lehnsherr together. Coffee was consumed, bean bags were made into thrones, and so forth. The last event of the day was Jenn and Kelly's Left 4 Dead panel. I wasn't as involved in that one as I was in the others as I've never extensively played Left 4 Dead, but it was still a wonderful time. Afterwords, my friend Amber and I found out just how intense of a Cherik (fandom slash name for Charles and Erik) fan Jenn really was. She flipped out, screamed, hugged us, and so on. It was really a huge deal for me since she's my cosplay idol and she was freaking out over me. 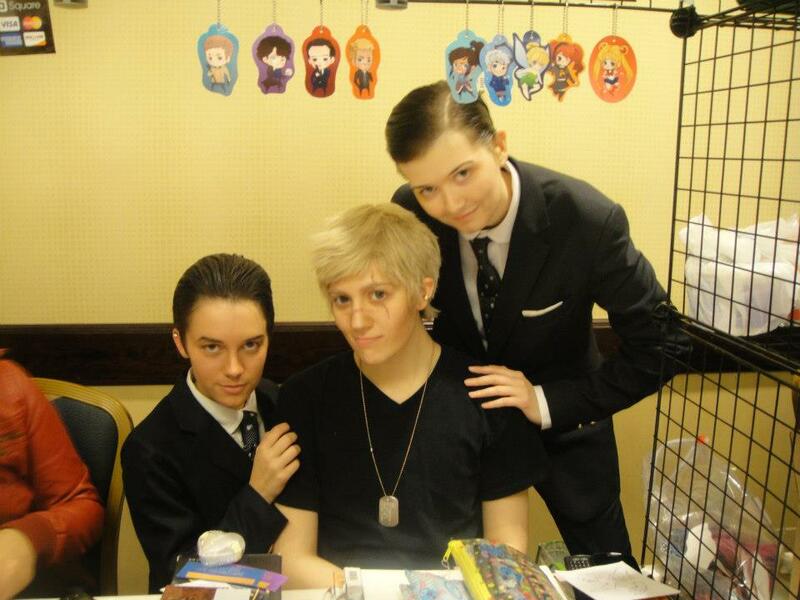 We eventually got our picture and said goodbye to the con. All in all it was a fulfilling weekend of glory, wonder, and fun. I can't wait for next year!